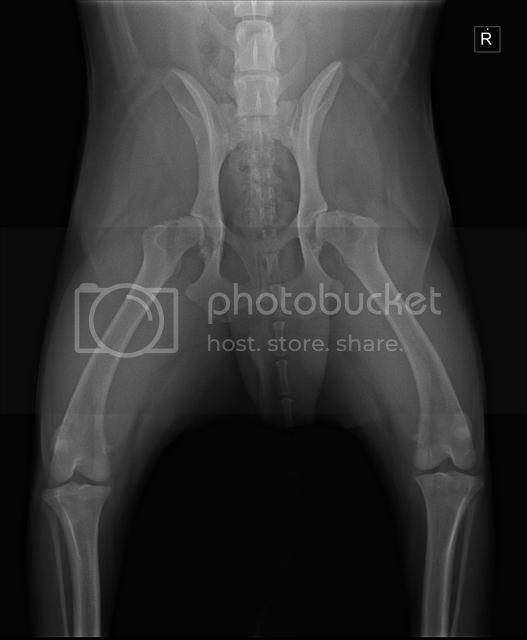 So I may have mentioned this in the past, but my chow chow has congenital severe bilateral hip dysplasia. In other words, he was born with the issue from the get go. As seen in both images, he has an incredibly shallow hip socket. The femoral heads are deformed and bone changes have already begun along the femoral heads and necks in just 2 years time. This makes sense, considering the behavioral changes in him that would indicate pain. The purpose of this thread though is to ask if anyone else has gone through this? We have known for some time now that this would be a long term, expensive adventure with our beloved Louie. 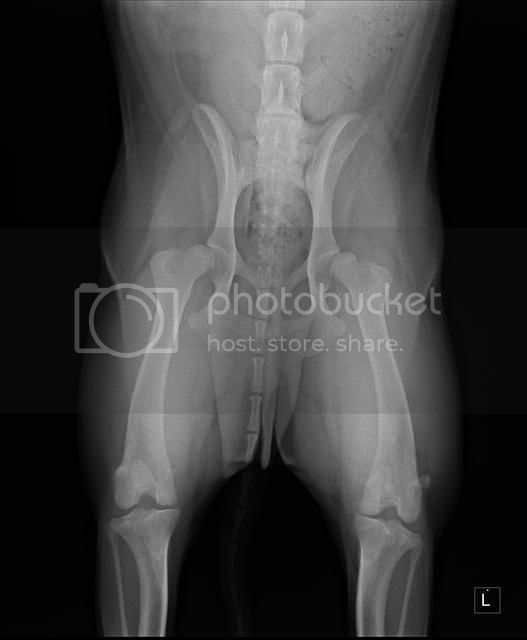 At this point in time, and the vet agrees, that pain management through forms such as acupuncture, laser therapy, etc might be the best option right now and then an FHO (operation removing of the femoral heads) may be the next step as a last resort to salvage range of motion in both limbs pain free. Has anyone had any experience with pain management regarding arthritis? If so, what have you tried and was it helpful? Or has anyone had the FHO performed on their dog? My Chloe has severe hip dysplasia. I discovered this when she was 5, she is now 8. She had no symptoms until all of the sudden she was limping one day. Off we went to the vet to find out this horrible news. Apparently she has been this way her entire life and we never had a clue. She had yearly physical exams but no X-rays. We went to a orthopedic specialist and I did tons of research. Basically we manage it until we can't. The specialist said we would use pain management when needed and when it no longer works then hip replacement or FHO are next. I have read entirely too much negative about hip replacement so that is not happening. After lengthy discussions with my personal vet and some research I will consider FHO depending on her age. She is now on rimadyl twice daily and Tramadol twice daily. I didn't really see a difference with just the rimadyl so we recently added the Tramadol. She is fine. Walks are shorter and we built a ramp off the deck to take those steps out of her life. Steps are not good! Since she is on both pain meds, she still jumps on the couch and never limps. I made the decision along with my vet to start the pain meds 6-12 mos ago?? The specialist...a surgeon...had said she didn't need pain meds until she was limping a lot, showing obvious pain, blah blah. I don't want her to hurt and she is the definition of stoic so when I noticed she was not getting on the couch (her fav place) as much, I decided it was time. Now we wait and I watch and worry. My vet has offered numerous pain management options and combos so there are several things you can try. We keep an eye on her lab work but she is tolerating them just fine. Rimadyl is expensive here but I buy it a bit cheaper online from Allivet. Are you sure the biting/chewing isn't allergies? Skin issues? Chloe has those as well. I'm sorry that you are going through this. It is heart breaking. The pictures tell the story, and there is no doubt that the hips are deteriorating. And I whole heartedly agree with pain management. Both of my rough dogs had ligament injuries when younger, and while definitely not the same as degenerative issues, the vet advice was similar. In the case of my 4 year old, surgery was recommended. I took a more conservative, holistic approach, and he probably healed about 90%. He will still favor the knee when its chilly or after a lazy phase, but is mostly fine. My brother has a 2 year old English Toy Spaniel diagnosed with luxating patella in both rear legs. Of course, limited activity was recommended to allow the knee to heal. Despite putting the dog in a 3x3 ex pen, he jumped up way too much and the fix didn't take. They are looking at having the 1st leg redone now. I guess the point is that getting your pup to cooperate for recovery period is difficult. We had a female that had severe bilateral Hip Dysplasia. She was on Dasuquin and Rimadyl for most of her life. Then later we added Tramadol also.This helped quite a bit until her later years. We went back and forth with the FHO and hip replacements. We eventually went with the hip replacement because of her age. She was 11 when we did it. We lost her at the age of 13 to liver cancer. The last two years of her life were probably the only time she was not in pain with her hips. Hip replacement is quite expensive. We had gone to several specialists trying to get her help. Most of them had good things to say about the FHO procedure.